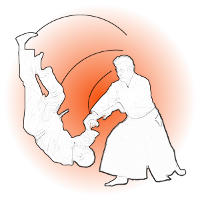 About the Aikido Etiquette The Aikido etiquette is extremely important to the practice and training of this Martial Art. Like all Japanese styles, dojo etiquette has a large role to play. Beginners are not expected to learn this Aikido etiquette straight away by heart, but pick it up within a reasoble time period. For beginners, learning this is important to show your willingness to receive instructions. 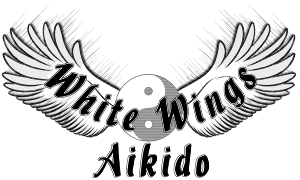 Dojo: Aikido training will take place in a room called the dojo, which in Japanese means the place of the way. The dojo is seen to be a sacred place of learning; it must be kept clean, tidy and free from any distraction. Rei: This means bowing, and is essential for any beginner to understand when learning the Aikido etiquette. It is a method which shows respect. It can be carried out in either a standing or kneeling position, with the later being the most formal. Rei - Formal Bow: Kneeling bow of thanks must be performed at the beginning and end of the class. Twice to the Kamiza, for thanks to the founder and the Dojo / Practice area, and once towards the Sensei / Instructor, who in turn returns his thanks by bowing back. 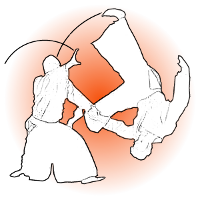 Retsurei - Standing Bow: Always respect the Dojo by performing a standing bow when entering, or leaving the practice area towards the Kamiza / Head of the mat. Sensei / Instructor: Respect the instructor by asking permission for assistance, or for permission to enter or leave the mat, remember to perform standing Retsurei Bow when doing so. Training: Have respect for your partner by performing the standing Retsurei Bow before commencing or ending training in Aikido. Do not enter into contests of strength, or compete with your training partner as injury will occur. Train in a relaxed, vibrant manner, but do not be casual or flippant in your attitude. Welcome newcomers, and help those who are less knowledgeable than you. We all have something to learn, and to pass on what we know helps others progress. This was O'Sensei's wish. We were all once beginners! First off - be punctual! Enter the dojo and be on the tatami (the mat) as early as possible, before class is scheduled to start. In the time you are waiting, ensure the mats are safely positioned and carry out warm up exercises. If you are late, then simply wait at the side of the tatami until you are seen and acknowledged by your sensei. As you step onto the mat, carry out a kneeling bow to O-Sensei (the Founder of Aikido). Join in the warming-up exercises or if these are over, do your own warm-up at the edge of the mat. As always, be aware of anyone moving or being thrown near you, and move if necessary. Occasional lateness or lateness caused by special commitments such as one's work schedule is acceptable, but lateness caused by poor planning or lack of conscientiousness is an indication of a lack of order in one's mind, and unless corrected will hinder one's learning and progress in aikido. Rei to the dojo Upon entering the dojo building, do a standing bow towards the Kamiza (shrine) by bending the body 30 to 45 degrees with the arms held by the side of the body. At all times, while in the dojo when not on the tatami, footwear of some kind must be worn. Put on your zori (sandals) or equivalent when getting changed, and leave them neatly at the side of the tatami during the practice. Leaving sandals in disorder indicates disorder in one's mind. Rei to the tatami (dojo floor) The tatami surface is the training surface in the dojo and as such it is important to bow there as well. Upon stepping onto the tatami, kneel down in the position known as seiza (sitting on the heels with the back straight) and bow putting both hands in front of the knees keeping the back straight. That bow is also required upon leaving the tatami. Furthermore, if for any important reason it is necessary to leave the tatami during the class, first ask permission from the sensei, then leave the tatami after completing a standing bow, if it is a temporary absence, or a kneeling bow if it is the end of your practice. Rei to O-Sensei (the founder of Aikido)The spirit of the Founder is always present in the dojo. In our aikido training, we cannot practise without thanking him for the gift of his art. We do a kneeling bow to the Kamiza at the beginning and the end of the class. If one arrives late for the class, one kneels and bows to the Kamiza upon stepping onto the mat. Rei to the Sensei After the rei to O-Sensei, the practitioners do a kneeling bow to the sensei. This should be repeated at the end of the class as well. At the beginning of the class it is customary to say Onegai-shimasu (Please help me in my practice) as one bows to the sensei; while at the end of the class, one says Domo arigato gozaimashita (Thank you very much). 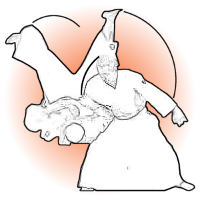 The instructor is referred to as Sensei during class and it is best to refer to them this way outside of class, as well. In Japan, anyone referred to as ‘Sensei’ is treated with respect at all times by their students – especially in the martial arts. Treat instructors with respect at all times. If you are enjoying your practice, then your instructor might be teaching you for many years! Teachers tend to teach best when they feel recognised and appreciated. Students learn best under the same conditions. Never compare an instructor with another. Every Sensei has something unique to offer – your job is to discover it. Rei to your partner Consider that your partner is the mirror of yourself. Ignoring your partner's individuality and self-esteem is against the spirit of aikido. Your partner is not someone you compete against, but a person to train with and improve with. Show respect to and consideration of your fellow practitioners in every aspect of the practice. Rei to any weapons being used Before and after the use of the bokken (the wooden sword), the jo (the 4-foot stick), or tanto (the wooden knife) hold the weapon at eye level with both hands toward O-Sensei and do a standing bow. Even a piece of wood can be a great help in one's aikido training. When one practises with it, it becomes a part of one's body. Thus, throwing around, stepping on or jumping over the weapon is disrespectful. Never Teach Other Students, unless specifically asked by your Sensei. Do Not Wear Jewellery During Practice. Jewellery may be damaged and can be dangerous if accidentally grabbed or caught. Footwear. Always wear some kind of footwear when not on the mats. Sandals (or thongs) are preferable. No shoes on the mats. Personal Hygiene. Keep yourself clean and cut your nails to avoid cutting yourself or others. Other General Aikido Etiquette. Be alert in the dojo at all times. 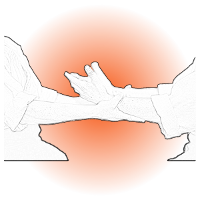 Accidents can happen through carelessness, which is another primary reason for the strict Aikido etiquette.